If there’s a defining characteristic of the Trilogy Alumni network, I think John Lilly put it best: it is all about the people. If you ask a Trilogy alum about how they plan to build a great company, you can count on them to start with a plan to hire the best talent. When you talk to Indeed.com, their worldwide recruiting process is forefront. When you hire a Trilogy alum as a director of engineering at Facebook, they revamp your recruiting and on-boarding. When you start a satellite office in Austin and hire an alum, they start by setting up the recruiting machine. Trilogy alumni know about great people and great recruiting processes, and experiences. Recruiting and building companies around great people is in our DNA. A measure of the power of recruiting, is the psychological effect it had on Steve Ballmer. In the video below, from 2010, he brings up Trilogy recruiting out of the blue. 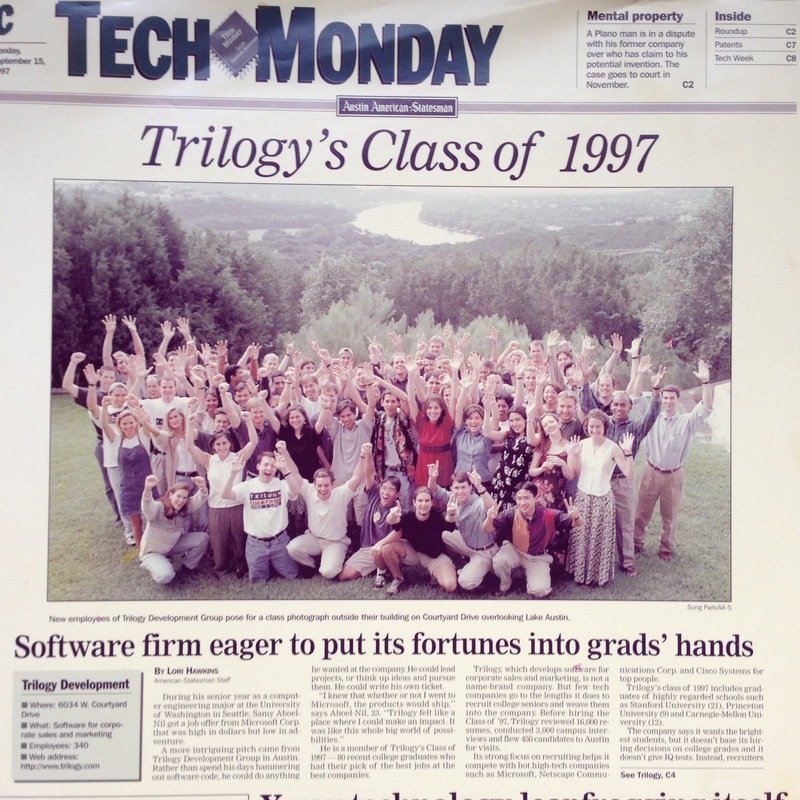 It is still on his mind 10 years later, the way Trilogy would beat Microsoft recruiting time and time again. He cited beating his 2010 contemporaries more than 50% of the time, but he didn’t make that claim against Trilogy – it wouldn’t have been accurate. There was no reason for him to bring it up. But the recruiting we did in the 90’s was the stuff of legend for a company our size. Also, you can see why Microsoft was having trouble connecting with college recruits in 2010. The answer to the question posed was one of substance and relevance, not winning percentages and legacies. Also, the video should be “starting” from where the question is asked, based on the link used, but it may not work consistently well on all browsers, etc. To be fair, Ballmer seems to mostly refer to college recruiting, not recruiting across all age groups. I am also reading “Work Rules!” by Laszlo Bock, SVP People Operations at Google and he’s very specific about Google’s company culture and recruiting process. I wasn’t fortunate to attend OTB ’15, but I’d love to know how Trilogy culture and recruiting compares to Google’s these days. I specifically mention Google because it is acknowledged by many that it has had a profound impact on many other Silicon Valley companies (in terms of culture and recruiting process). The context of the interview was entirely at a UW campus and the discussion was entirely about college recruiting – thought that was clear and rendering the all age groups distinction moot – I don’t see that discussing other age groups improved the outlook for MSFT/Ballmer. Google’s recruiting process is horrible for the candidate, and well documented – almost the antithesis of Trilogy’s recruiting process. Historically, it was highly data driven, GPA driven, curriculum driven, then followed by erratically timed interviews online, but Google could and can afford to have a painful process because people want to work there. They have the want part sorted, all they have to do is sort through the applicants. Trilogy had to convince people to work there – the want was generated through a great recruiting process- a totally different (and bigger) challenge. Ask Jocelyn sometime about her opinion of the negative impact Google’s recruiting approach has had on lots of other SV companies (including, for a time, Facebook, until they started adopting approaches adapted from Trilogy). My Google interview experience was a good one, although I suspect it was atypical because of an internal referral. Smooth process, 4 onsite interviews, quick turnaround. But not typical. In general, I’d characterize Google’s culture as more mature and sustainable as Trilogy’s, but also less… interesting, entrepreneurial, gets-stuff-done. Recruiting, in particular, is understood to be important, but it doesn’t have nearly the same polish or attention as it had at Trilogy. I agree with Scott – Google depends on the fact that it’s a household name for its recruiting success. With Google, I didn’t feel like I was being sold to, because they didn’t feel like they needed to. Love the TU97 Statesman shot at Courtyard Drive, Scott. Nice touch. credit to Chris Hicks for rescuing that picture! Thanks Mike and Francis for your respective insights. While reading your comments, I couldn’t help thinking about the famous recruiting joke (http://www.ahajokes.com/hea26.html). And to say that Google doesn’t have the same attention to recruiting as Trilogy is a bit curious, when you know that until recently, Larry Page reviewed each and every candidate that was recommended as a hire by hiring committees. Yes, the candidate’s experience until recently was gruesome, but it has improved in the last few years, although I understand (from friends who work there) that the recruiting bar is still very high and the process pretty challenging. I’m not sure this is necessarily a bad thing, though (re: the recruiting joke). To be clear, “And to say that Google doesn’t have the same attention to recruiting as Trilogy is a bit curious” isn’t what I nor Mike said… I just said they don’t have to SELL you that hard, because Google is a household name and brand (Trilogy wasn’t, when we were recruited there, so the sales process got a lot more emphasis than it needs at Google).